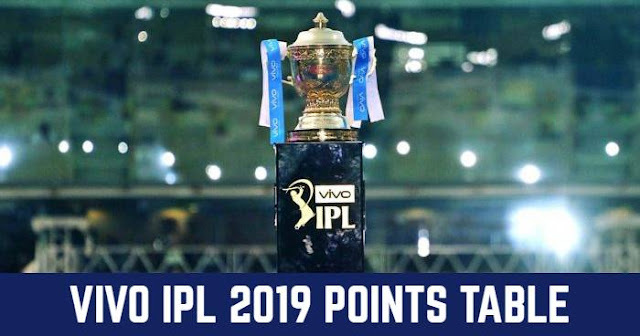 The 7th match of the 12th season of Indian Premier League - IPL 2019 will be played between Royal Challengers Bangalore (RCB) and Mumbai Indians (MI) on 28 March 2019 at M. Chinnaswamy Stadium, Bengaluru. As war as the weather is concerned, it will be a warm day and slightly cooler evening; temperature below 30°C during match hours. Dew will be seen during the second inning. A fair amount of grass is seen on the pitch which means the ball will zip around a bit. There are a few cracks as well to interest the spinners. The grass should also hold the pitch together. The pitch at the stadium has had its fair share of talk post the revamp in 2016. It's played slow, at times been full of runs, but it got better with time. Both teams are yet to open their account this season; coming with losing their opening match of the tournament. Royal Challengers Bangalore were defeated by Chennai Super Kings and Mumbai Indians by Delhi Capitals. Mumbai Indians had a serious problem as Jasprit Bumrah had injured his shoulder at the end of the Delhi Capitals innings in the last match. Reports emerging from the MI camp have indicated that the injury isn’t serious and that he is recovering but the is camp refusing to reveal if the pacer is match fit. Bumrah will be assessed before the game but if the practice session is anything to go by, Bumrah looks very likely to play he hit the nets on the eve of the match, but there’s a good chance though he will not be risked in this match and will be given time to recover completely. MI have been boosted by Lasith Malinga becoming available; if he joins up with the team in time, he could fill in for Bumrah, which will then force MI to bring in Mayank Markande in place of Ben Cutting. Royal Challengers Bangalore most likely will be playing with the unchanged squad. Mumbai Indians (MI) and Royal Challengers Bangalore (RCB) have played 23 matches against each other in Indian Premier League (IPL). Out of 23 matches in IPL, Mumbai Indians have won 14 matches whereas Royal Challengers Bangalore has won only 9 matches. RCB have extremely good records against MI at M. Chinnaswamy Stadium, Bengaluru with winning 7 matches of the 9 played between them at Bengaluru. The average first innings total in IPL 2018 matches at the M Chinnaswamy Stadium was 187. AB de Villiers scored 4 half-centuries in 5 innings at the M Chinnaswamy Stadium last season. 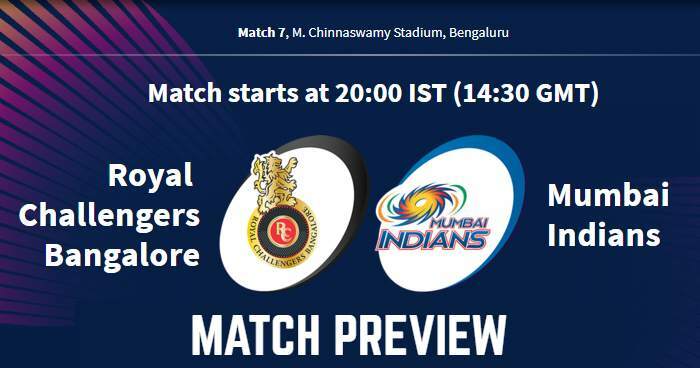 Playing XI for RCB: Virat Kohli (c), Parthiv Patel (wk), Moeen Ali, AB de Villiers, Shimron Hetmyer, Shivam Dube, Colin de Grandhomme, Navdeep Saini, Yuzvendra Chahal, Umesh Yadav, Mohammad Siraj.